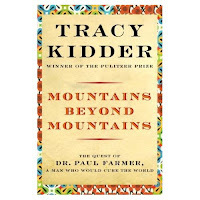 A few years ago, I read Mountains Beyond Mountains, Tracy Kidder's excellent biography of Dr. Paul Farmer. The book (like Farmer's life) reminds me of the immense power of a determined individual. Dr. Farmer found his place and purpose in an impoverished place not so far from our own borders. His organization, Partners In Health, has been serving rural Haiti since 1987. Now, although two hours from Port-au-Prince, earthquake victims are arriving for treatment. A local church is being used for additional treatment space. Partners In Health is an American foundation born out of Haiti. This organization is one of the most knowledgeable and prepared to serve Haiti. Within hours of the quake they were already working to route critical supplies through the Dominican Republic. Their Stand with Haiti site offers news from their Haitian clinic. Please consider helping them help others. Giving (according to psychological research) is one of the most gratifying ways to spend your money. The Amazon links in this post benefit Partners in Health as will any additional Amazon shopping through these links. ***Baby Toolkit is the work of a some opinionated geek parents. Partners in Health is an AMAZING non-profit humanitarian organization created by a hard-working doctor with genius and compassion. These opinions are freely given and we have no undisclosed relationship with Partners in Health (beyond the sizable intrinsic benefits in giving). These are good people with insight; Help them change lives. Adrienne, good for you! I was thinking about Tracy Kidder & getting Greg Mortenson's story wound up with it in my head... So I needed your post to get my mind straightened out. We are going to give & I think Andy is going to share the idea of supporting PIH, as well. Thanks for doing this post.